Fishing and Bowfishing are two great ways to get added fish and protein for your diet when living off the grid. Part of this will be learning how to gut and cook the fish. Gutting a fish is relatively easy once you learn. Make a cut behind the dorsal fin, over the back, and under the other dorsal fin. Grasp the head to anchor yourself during this process. Slice off the dorsal and ventral fins if you wish. If you're working with a particularly spiny catfish, the skinning process may be easier if you remove the fins. This isn't necessary if your catfish is less spiny. Make a perpendicular cut along the spine. Take care not to break the spine with your knife; just make a shallow cut to help in the skinning process. Use the pliers to peel back the skin. Lay the fish on it's side and use the pliers to grasp the skin where you made a cut at the dorsal fin. Pull the skin toward the tail. Flip the fish and peel back the skin on the other side. Use a knife to help loosen the skin if it's difficult to peel. Remove remaining bits of skin with your fingers, if necessary. Rinse the fish again. If possible use a hose, or the faucet provided by the marina. The pressure should be just strong enough to remove loose scales; avoid blasting the fish with water, as the meat inside is delicate. Regardless of whether you fish with a traditional reel and rod, or with a bow and reel, you will still need a local fishing license that is valid. So in Ontario you need an Ontario Fishing License, which you can get from your local Ministry of Natural Resources office - which means getting an Outdoors Card - which allows you to buy fishing and hunting tag licenses. A variety of different rules apply for fishing and hunting, so you will need to read up on all the relevant laws and licenses on government websites for wherever you happen to live. 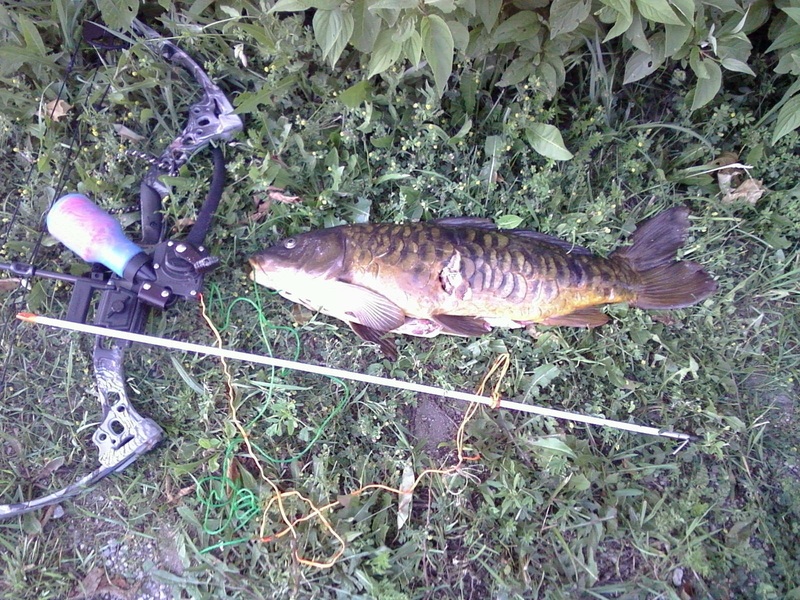 In Ontario the only kind of fish you can do bowfishing for is carp. Everything else is illegal. So it is important that you know what carp looks like before you try bowfishing for carp. See the photo on the right and also the top right to see what carp look like. I also have a detailed photo below of what carp look like. As you can see they get pretty big. They're not dinky fish. Not huge either. It is also important that you know how to shoot a bow. If you are new to archery it is recommended you take some archery lessons first. You can also get free archery tips from a variety of websites. Most people who do bowfishing use a compound bow because that is what is commonly sold at hunting and fishing stores. However if you are skilled archer you can also use a recurve bow or even a longbow. 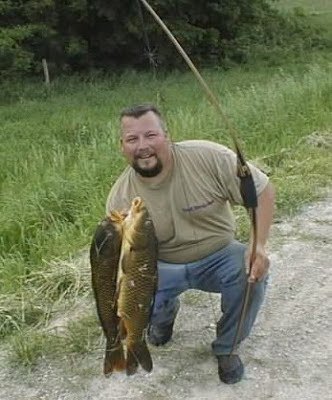 The photo way at the top of this post is of a man with a longbow showing off the carp he caught. In theory you could even use a low poundage crossbow. But crossbows are pretty much overkill when it comes to fishing - and they are not commonly use for fishing so it will be difficult to find a bowfishing reel designed for a crossbow. I also found the YouTube video below, a guide to bowfishing. The guy in the video does a VERY GOOD job of explaining how to bowfish. Very handy to watch and learn. This second video is NOT a how to video. But it is a video about bowfishing for carp so I thought I would include it so people can see them in action.